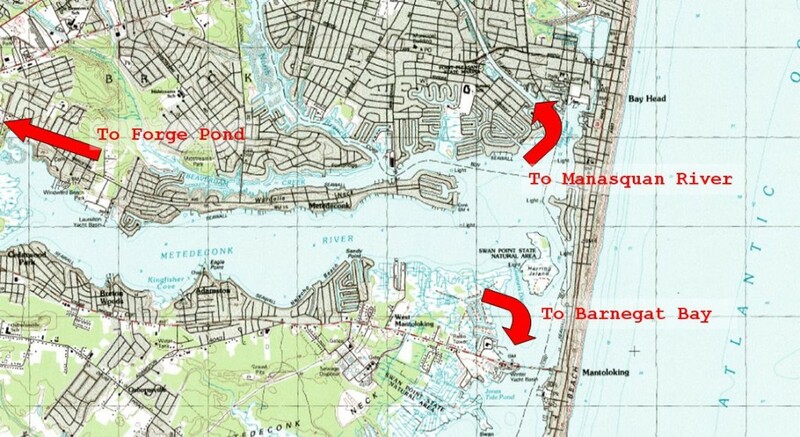 The River flows from its North (20 miles/32 km long) and South Branches (15 miles/24 km long) to their confluence at Forge Pond, where the river widens (up to just over 1 mile/1.6 km) and flows southeast for 6 miles/9.7 km into Barnegat Bay. The river emptying into the Bay. It also shows that prior emptying into the Bay, the river twice widens into two distinct areas. These two areas create a convenient division for separating the fleets competing in the Callahan Regatta. In the past, the A Cats and the M Scows have raced on the western portion and the Sanderlings and Sandpipers on the eastern portion.